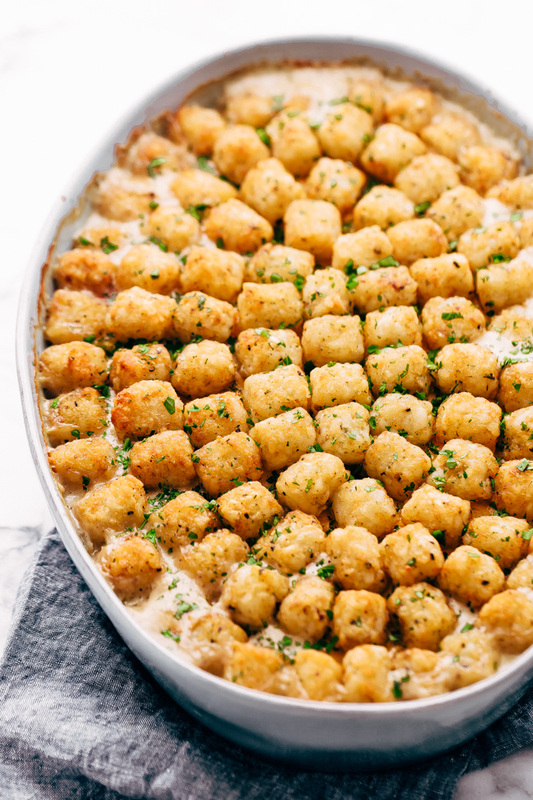 Learn how to make a chicken pot tater tot hotdish! This is a traditional chicken pot pie kicked up a notch with shredded cheddar cheese and tater tots. 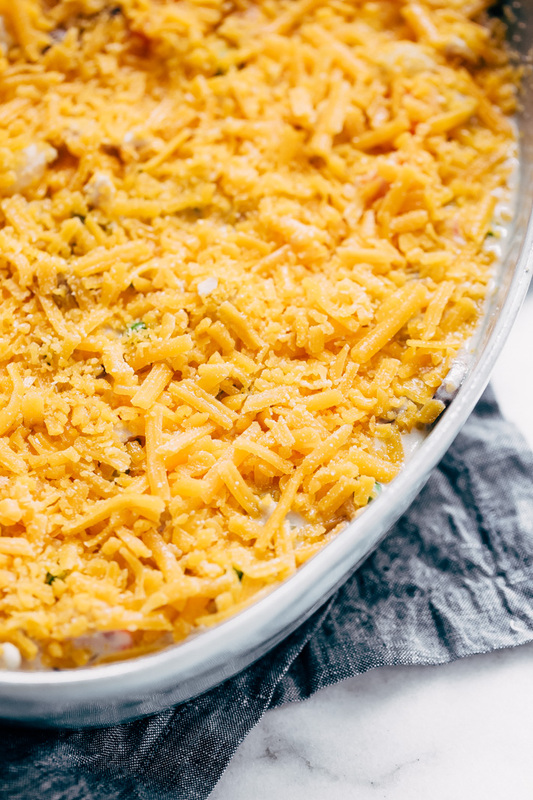 This hotdish is the perfect way to use up a leftover rotisserie chicken or Thanksgiving turkey! Call it a chicken pot casserole or a tater tot hotdish; I don’t mind either way. This is what real food is, love in a casserole dish. It begins with your typical chicken pot pie ingredients (minus the actual pie crust, obvi). Then we’ll add mushrooms and seasonings, top it with shredded cheddar cheese, and before you know it, you have a beast of a different nature. I’d show no displeasure to the traditional pot pie. But there’s also a general consensus – everything is a better when tater tots are involved. That’s saying something when it comes from a self-proclaimed bread lover. To be honest, I had my doubts I’d be able to get this hotdish recipe over to you before the weekend. Over the last week, we encountered several unexpected issues that caused the site to go down. 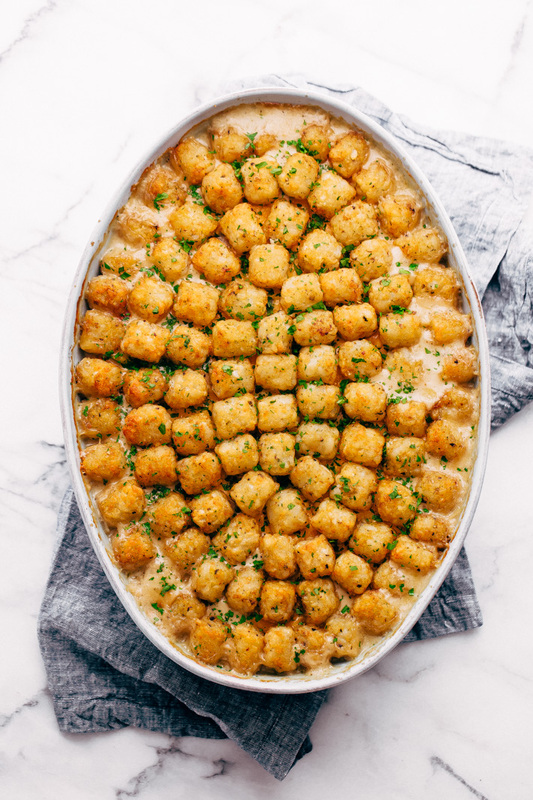 Even as I was putting this tater tot casserole together on Wednesday, I was praying the site would get it’s act together quickly so that all of our weekend plans would involve a casserole dish full of this stuff. Last year I shared my chicken pot pie soup  that consisted of tender egg noodles along with all the things we love about chicken pot pie but in soup form. I get that everyone may not enjoy soup as much as I do. I mean, I could basically eat soup for weeks on end and still not complain. But that’s just me. So this time, I went back to my Midwestern roots and decided a casserole was what we all needed. 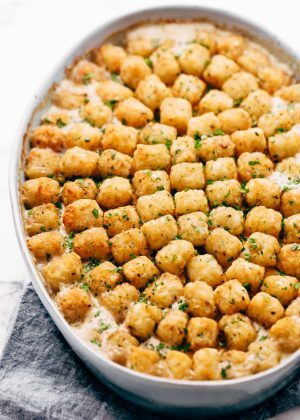 And though a traditional tater tot hotdish has ground beef and veggies, I decided to give it a modern makeover and combine the most traditional comfort food with tater tots. I mean a tater tot casserole is food for children and grown-ups alike. It’s man food; it’s comfort food, and I don’t think a single person can complain about it. As with most of my recipes, my tater tot hotdish contains precisely zero cans of condensed this or that. It’s also great when there’s just two of you and you cooked a whole roasted chicken on Friday and need to use up the leftovers somewhere. Or on Thanksgiving when you’ve got all those odds and end meat pieces left – MAKE TURKEY POT CASSEROLE. A bit of good news for those that hate cleaning pots and pans. If you’ve got a 4-quart dutch oven (or any oven-safe pot, really), you can make this a one pot recipe. Me? 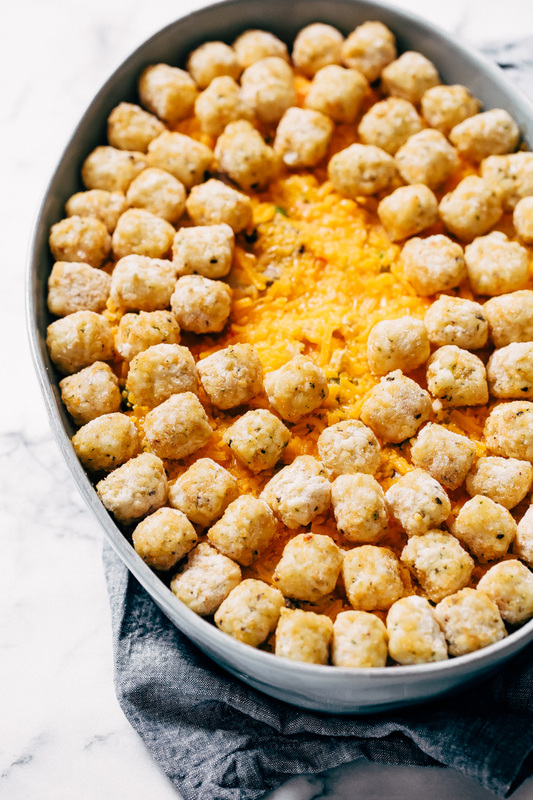 I could’ve easily baked this in a dutch oven, but that would mean the ratio of tater tots to casserole base would be what any sensible adult would have. Honestly, I don’t need that kind of negativity in my life. So if you’re like me, don’t come home with a single bag of tots, it’s just not enough. I learned this the hard way and ended up making a second trip to the store. Priorities, you know? Clearly, I’ve got mine all sorted out. Start by melting the butter, let it get to the point where it begins to crackle and pop, then add the mushrooms. Saute those them so they develop a little color. Then we’ll add the celery. I know what you’re thinking, where are the onions and carrots? I’m using crinkle cut carrots and pearl onions in this recipe to give it a heartier texture so we’ll add those in later. Then we’ll sprinkle in some flour, an all-purpose seasoning blend and this is optional, a bit of garlic powder. The all-purpose seasoning blend I used it the one from Trader Joe’s, it’s called the 21 seasoning salute. I love that stuff! It’s salt-free, and it’s the one I use in my chicken wild rice soup . Mrs. Dash  (affiliate link) also makes one that you can easily find in most grocery stores. Once that’s done we’ll stream in the milk and broth and let it all thicken. Stir in the pearl onions, crinkle cut carrots, cooked shredded chicken (or turkey, if you’ve got Thanksgiving leftovers!! ), and peas. Top it with shredded cheese and the tater tots. The ones I used for my tater tot hotdish are the roasted garlic and black pepper ones from Alexia. This is not a sponsored post. Just a friendly suggestion from one garlic lover to another. When you pull the casserole dish out of the oven and serve yourself a spoonful, make sure you dig all the way to the bottom and get a little bit of everything. 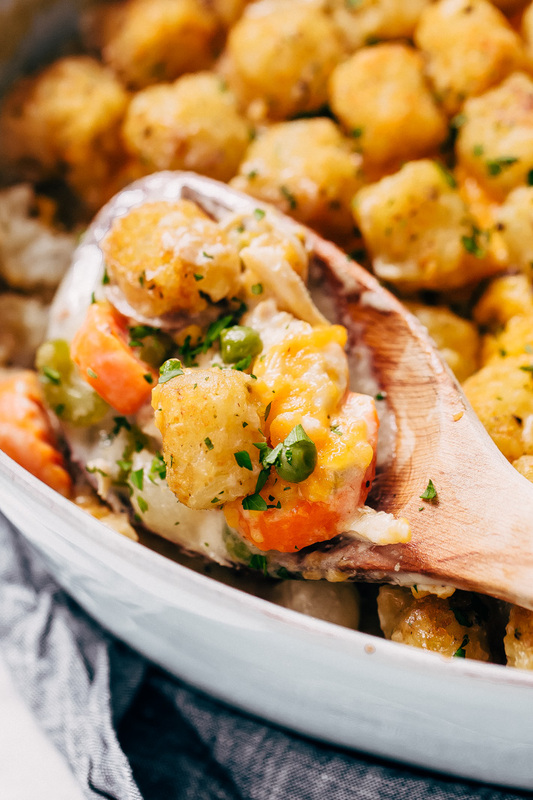 That first bite has perfectly tender veggies, a creamy, buttery sauce, and lightly golden and crispy tots. True midwesterners, serve these with ketchup. Midwesterners transplanted in the south: douse this in hot sauce! Seriously, I know how weird it sounds, but oh boy it’s good! 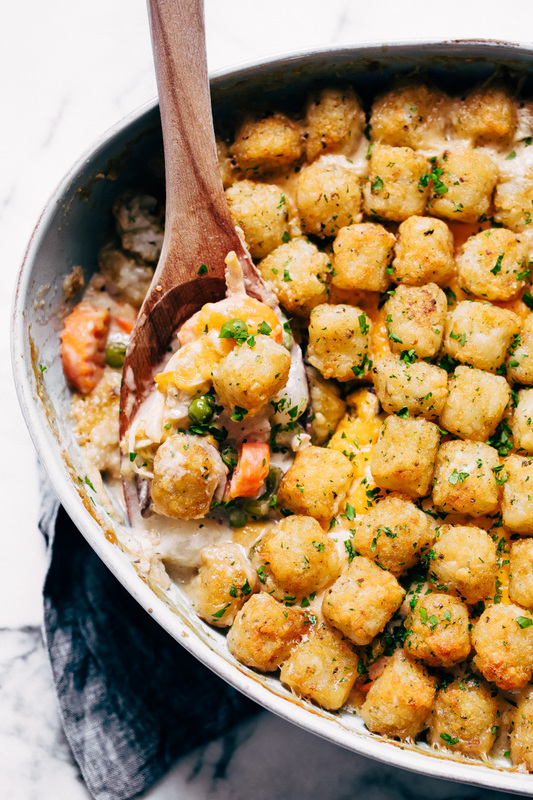 A simple chicken pot tater tot hotdish loaded with chicken, veggies, a creamy sauce, cheese, and tater tots. That covers all my major food groups. brown the veggies: Melt the butter in a 4-quart dutch oven (use oven-safe if you don’t want to transfer to a casserole dish) over high heat. Add the mushrooms and allow them to brown, about 5 minutes. Add the celery and let it cook for about 3 minutes or until slightly softened. Sprinkle the flour over the veggies and stir to coat evenly. You’ll notice it starts getting dry and crumbly, let cook 1 minute. Season with the dried thyme, all-purpose seasoning, and garlic powder (if using). make the base: slowly stream in the milk while you use a whisk with the other hand to work out any lumps. Add the chicken broth and allow the soup to reach a simmer, this will take 8-12 minutes. While the soup reaches a simmer, position a rack in the center of the oven and preheat the oven to 425ºF. 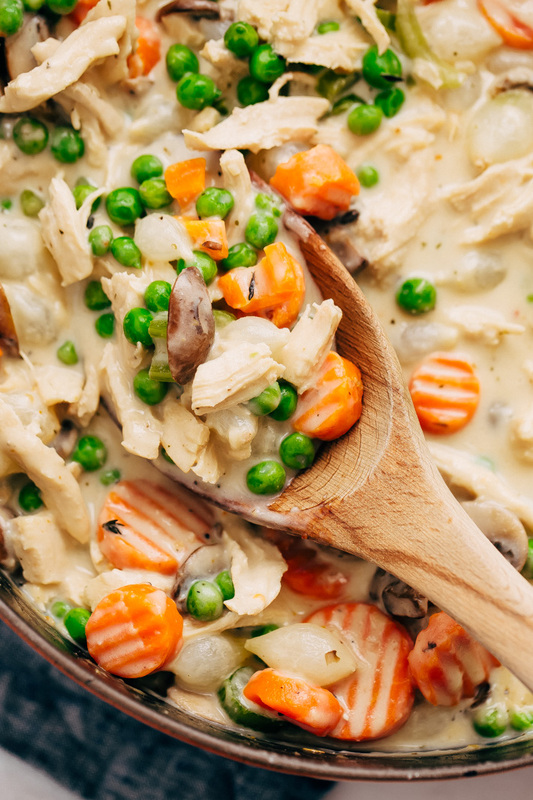 Once the soup reaches a simmer, add the shredded chicken, onions, crinkle cut carrots, and peas. Stir and allow the mixture to come back to a simmer. bake: Spray a 9×13 baking dish with nonstick spray. Transfer the prepared chicken mixture to the dish. Top with the shredded cheese and the tater tots. You’ll need more if you’re using a baking dish and less if you’re using a dutch oven. Bake for 27-32 minutes or until the tots get nice and golden brown. I like to turn the broiler on for the last 1-2 minutes just to give them a little more of a crisper texture. Let cool slightly before serving. The seasoning I use is the 21 seasoning salute from trader joes which is almost the same thing as the Mrs. Dash’s  (affiliate link). If you decide to bake this off in your dutch oven, you’ll need only 1 bag of tater tots. If you decide to bake this in a casserole dish, you’ll need 1 1/2 bags of tater tots.